Gift or wear a one of a kind piece by adding your words of inspiration to this silver hammered cuff bracelet. 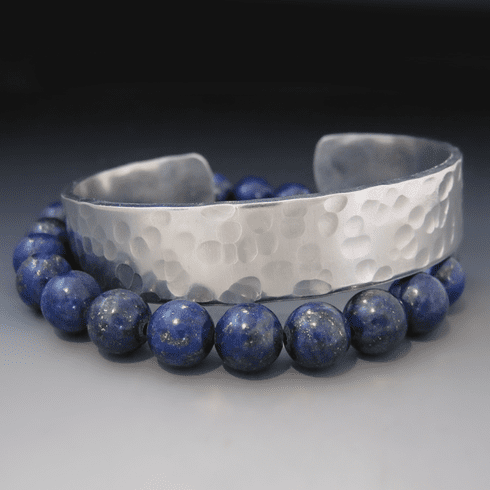 The silver cuff is layered with a blue Lapis Lazuli beaded gemstone bracelet to add depth and dimension. Lapis Lazuli was called by the "The Stone of Heaven" by the ancient Egyptians. It is said that it helps the heart and protects against depression. This brilliant blue stone is a symbol of power and is considered a friendship stone. It releases stress, bringing one a sense of deep peace.